YOUR ULTIMATE EVENT MUST HAVE FOR THE SEASON IS HERE! 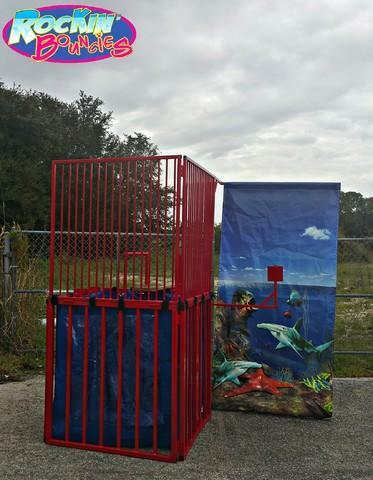 Our fully collapsible dunk tank has a window in the front so you can see the "Dunkee" go submerged underwater. These exciting attractions are great for school, church and other non-profit organizations looking for a great fundraising tool. Just put the school principle, company boss, or town mayor in the "Hot Seat" and watch people line up and pay for shot at sending them into the deep blue! Note: The dunk tank is delivered and setup without water, so you will be responsible for your own water source and filling the tank. Great for School and Church Fundraisers. Perfect Team Builder at Company Picnics. Simple to setup and use anywhere water use is approved.